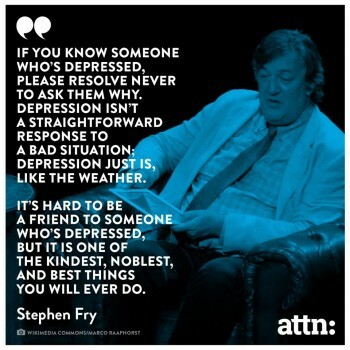 Very good post on the seriousness of depression SJ. Also the erosion of things in life, specifically migraines, was right on. It would be good if people didn’t have so many verbal handshakes but asked such things and really cared about your reply. Well, verbal handshakes do serve a purpose – you can’t get into things deeply all the time with everyone, or you’ll wear yourself out and run out of time quickly! So it’s good to just quickly say hi in passing; it’s better than silently passing. I’ll see a friend next week for lunch, and when she asks me how I am, she’ll want to know the deep down, true answer, with all the nuances; when I see her the next day in the midst of the crowded room at WI, neither one of us will want to go into all of that in that environment.